When, a year or so ago, I saw Jeff Nichols Palme D’Or nominated Loving (2016) it seemed like an odd fit for the director. Not in the sense that it didn’t deserve a nomination; of course it did. But more in the fact that it seemed so at odds with his past repertoire. The film, the story of the interracial couple who successfully got the circumstances of their marriage legalised by the Supreme Court, is rooted deeply in its own truth and in the past. Something that Nichols’ past releases have not been. His works have consistently featured science-fiction or fantasy elements (some more than others, naturally) and on my first viewing, seemed nothing like the romantic, socially-conscious narrative of Loving. It’s a work rooted in objective fact, in events that happened, with a wider context of history that the vast majority of the population should be aware of already. Why would this director of such fantastical and fictional figments of his imagination be drawn to this, I wondered? So I began thinking about his past works, and what clues there could have been in them, because up until now he had carved an auteur-ish niche that I can only assume most of his followers/fans/observers would have been happy for him to continue working in. The thing is, after seeing Loving and thinking about this, I wholeheartedly believe that he’s still an auteur, and is working in exactly the same way as before, dealing with his stories in the same way, with the same thematic implications. I confess, I have not seen Shotgun Stories (2007) so must begin this very personal, subjective retrospective by looking at his sophomore project, the fantastic Take Shelter (2011), before moving onto Mud (2012), Midnight Special (2014) and finally Loving. At its core, Take Shelter is a film about anxiety. Curtis, played blindingly well by Nichols’ regular Michael Shannon, is a man crippled by the anxiety of turning into his paranoid schizophrenic mother. His life at the opening of the film is one that his friends envy. His wife and daughter love him as much as he loves them, and he has steady work; a lucky thing to have 3 years after the economic crash. What we fear losing the most, when conscious of our fortune however, is that which is granting it to us. In this case, the down-to-earth Curtis’ grim determination and steady mind has allowed him this life. It is a testament to his character indeed, that when experiencing his anxiety, and seeing his life start to crumble around him he is not paralysed. He acts and keeps a definite agency throughout the film. This is a noticeable trend throughout Nichols’ screenplays. The film has so much more drama and tension because Curtis tries so hard to resolve it, not simply because he is subjected to such personal and terrifying anxieties. His proactive, often frantic momentum in the film shows us just how much he fears losing his family. It is telling that the emotional catharsis of Take Shelter arrives by the mere of opening of a door. It’s through Curtis’ simple decision to act, and the action itself that is the film’s most dramatic moment; a moment directed with such acute awareness and emotional subtlety that upon first watching it I wryly smiled at the knife-edge Nichols had to walk to avoid the reveal of what was on the other side becoming purely comedic, rather than cathartic. It’s true, the most thrilling action is character. When I was watching Take Shelter I was struck by the outlandishness and ingenuity of its apocalyptic visions. The haunting dreams and wallowing, heavy atmosphere of dread pervaded my being, the film is completely singular in its vision and focus. However its grounded and intimate images of a wife and daughter struggling desperately to understand what the man in their life is going through, is far and away the more striking element of the film. Mental illness is a truly individual suffering; a lonely experience that is often left painfully short of explanation when mere words are used. Curtis, without a doubt, is a man of action not words. As his family becomes increasingly perplexed and worried by his behaviour it strikes us that they seem like completely reasonable and rational steps to him. It speaks volumes of the coherence with which Curtis’ character is written that while we see from the outside that his actions are hard to explain and causing anguish, we completely, unequivocally understand the thought processes that have led to them. Moreover, our understanding comes from a place of sympathy. Much of the enjoyment this film has to offer comes from its apocalyptic tone and narrative. The scale of the devastation Curtis fears is huge. The momentous, grand beauty of the film however, is in the intimacy of it. Take Shelter is about one man, and the fear of losing one’s family. Curtis’ whole world is his family, and to him this is what the apocalypse is. This is the greatest fear. The final shots of the film embody this completely. They confer not an impending apocalypse or worldwide destruction, but something much more subtle and resonant. Curtis’ family is finally at an understanding of what he is experiencing. They watch together, a beautiful moment of shared compassion made more poignant by Samantha’s understated, loaded uttering “Okay.” The storm they are seeing has been understood, but still threatens to tear their family apart, a reference to the fact Curtis must be sectioned upon returning home. And so the universal - the destruction of Earth - is made intimate and personal. Take Shelter is almost a lesson in writing, teaching us that intimate personal drama is often more thrilling and convincing than large-scale, impersonal stakes. In lieu of a smooth segue into this next part, let’s dive straight in with confidence, as Nichols does at his best. Mud (2012) is at once worlds apart and so very similar to Take Shelter. It has a fantastical, fairy-tale tone to its scenes featuring Mcconaughy’s eponymous rogue, and it’s this fantasticality that would initially appear to be its shared similarity. However, that isn’t what the film’s really about. Mud is both a coming-of-age film about the pains of adolescence and the different paths we take through life, and also a film about the end of an age; of a way of life ending before it’s time. The backwater Arkansas area in which the two boys live is changing as they do, and the lives their fathers led are ending. Fathers play a significant role in the film. Their sins, actions, absences and a lot of what they do not say is given emphasis enough that their influence on the sons of the film is as affecting as Curtis’ actions in Take Shelter. Ellis’ father is harsh, an honest man who cares for his son but struggles to show him this. He sells fish but can’t engage Ellis in the work too, hinting perhaps that he is the last in a long line of fish sellers. After all, the family are being forced out of their home on the water, shifting them away literally and metaphorically from what it provides them. The relationship (or lack thereof) between Ellis and his father is what drives him to look to Mud for guidance and structure. Incidentally, Mud’s ‘father’ is Ellis’ neighbour across the water, despite also viewing and characterising Mud as a mythical, mysterious creature. He again will be forced to leave his riverside home. Fathers are leaving left, right, and centre. Neckbone’s father is entirely absent, the boy is largely self sufficient under the eye of a cousin or uncle, played by Michael Shannon. This fascination with fathers is something consistently littering Nichols’ films. Midnight Special and Loving both feature fathers working hard for their children, while suffering from huge, almost otherworldly pressures. Likewise with Take Shelter, the impossible and improbable is exactly what they’re trying to achieve for their families. Balanced with this in Mud is its grounded, realist approach to action and drama at home. It is understated and un-stylised, presented with Nichols’ natural emotive instincts but never melodramatically. The dreamy, romantic fantasy peeks through only when Ellis and Neckbone are travelling to Mud’s island; a world apart from their troubles at home and school where dreamy atmosphere and child-like wonder takes a back seat for responsibility, stress and social pressures. Contrasted, these become a clear parallel to Take Shelter’s narrative structure, of apocalypse and family drama. Moving on again, to Midnight Special, which bears more similarity with Take Shelter than Mud, both thematically and in its action and supernatural focus. Again it features Michael Shannon in the leading role, but a host of other well known faces too. Again, Shannon plays a father: this time, one who has rescued his son, Alton, from a religious cult. The cult worship Alton who has supernatural powers. Pursued by their hitmen and the government, and joined by Alton’s mother (Kirsten Dunst) and a former State Trooper (Joel Edgerton) who’s witnessed Alton’s abilities, they make their way to co-ordinates Alton has described. The film contains many elements of science fiction. Nichols himself has said that the films Close Encounters of the Third Kind and John Carpenter’s Starman were in his mind while writing and making the film. Chase movies influenced him too, evident by the wonderfully deep and layered sound of the car during the film, and the several chase sequences that are as immersive and entertaining as any Fast and Furious film. It would have been easy for Midnight Special to get lost in surface concerns like plot and world-building and spectacle, but it remains closely personal at all times. We are intimate with our 4 main characters, very rarely straying from their perspective. Their relationship with each other, and particularly between father and son, is at the forefront of the film. Michael Shannon is without a doubt one of the finest actors working today. He displays such a warmth towards Alton, the intense love that fathers feel for their children, but also conveys so well the fear that he feels towards him. Is this fear because of Alton’s powers? Perhaps it’s a more general fear, of how we can provide for and protect our children, when they so often seem to simultaneously eclipse us and still be so vulnerable. Kirsten Dunst’s performance is easily on a par with Shannon’s. Her unconditional love for Alton is obvious, and the final scene of her standing alone in a field is so devastating because she’s given us this understanding so clearly. The other performances in the film are just as well studied and well written. Joel Edgerton is sympathetic and forwards the narrative, while being given enough agency to have noticeable impact on the plot. Likewise with Adam Driver’s appearance. Again, it has layers of development and story action that remain largely unsaid. 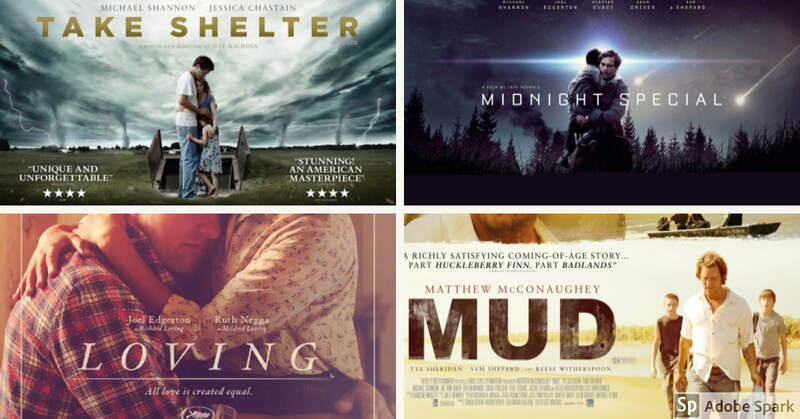 But aside from all this; the usually formulaic elements of a film review, how the cinematography works, and the music and all those things, what connects Midnight Special and Mud and Take Shelter is their absolute sincerity. Nichols’ films all have a gentle, warm probity about them, as do his characters. Their genuine decency shines through them in action rather than in words. Because of, or maybe causing this is Nichols’ writing. He wrote the screenplays for each of his films, And as we’ve seen they’re all about family, relationships, love, connectedness. They are about how these things can overcome whatever misfortune, or struggle, or action is put in their way. In a word, they’re about ‘us’, in a sort of messy, collective, multiple-meaning, abstract sense that I’m finding entirely unhelpful in defining what I mean here. ‘Us’ in a shared commonality, a humanistic sharing of experiences. This brings us on to Loving. Which, of course is about exactly those things: about family, about love and a struggle for that to prevail over industrialised racism, bigotry, cultural racism. Now, having written this piece, it makes complete sense that this should be a film written and directed by Nichols. Richard Loving embodies entirely the genuine, decent, loving father (figure) that his films contain. A man so uncomplicated, so of action instead of words that, when given the opportunity for a grand speech to the key judge who will decide their case, simply says “tell her I love my wife.” And that, for Richard Loving and Jeff Nichols both, is all that needs to be said. Ruth Negga, too, embodies the mothers of his past films, in her resolute, uncompromising and beautiful strength. Her Mildred is a quiet store of great patience, work and love, celebrating those qualities that shine through in Jessica Chastain’s Samantha and Kirsten Dunst’s Sarah. I was quick to judge Loving when it came out. I was quick to assume that it was different from the film I expected. With my own preconceived notions about what a sci-fi, a fantasy drama, and a social realist drama film is I couldn’t connect them. But what I see now, and what I will continue to embrace about film, is that it’s not the genre, or the expectation, or the style of a film that makes it what it is. What makes a film, and what connects us with great cinema - with all cinema - is the people that inhabit them. These wonderful, strange creatures written into existence and given life by performance, and by the love the director and actors feel for them. They can show us parts of ourselves we would rather not see, and can challenge us because of it. Or they can embody that which we most hope to achieve.